I’m afraid I’m going to have to admit that I have turned into that “crazy dog lady”. I always said it wouldn’t be me. I have liked dogs, well-loved dogs, my whole life but was determined to not become one of “those” people. But sometimes you just can’t stop the freight train from reaching the station. I grew up in a small town in the country. I spent hours in the stream behind my house catching minnows, frogs, and salamanders. My bedroom wall was lined with hamster cages and fish tanks. My favorite book was Go Dog Go and my favorite author Gerald Durrell. We had a few cats and of course, the dog. She was the worst behaved dog ever placed on this earth but she was my nine-year-old life inspiration. She barked non-stop, tried to bite several neighbors and enjoyed sleeping in the bath tub and occasionally on the dining room table. In my mind, she was nothing but pure fun. When it was time to go to college, my profession of choice was to be a wildlife biologist. I simply wanted to hang out with animals and thought this would be an ideal career path. But sometimes imagination and reality don’t line up so I graduated with a degree in business management. Upon graduation, I did what so many college graduates do and took a job in the restaurant industry and began a successful marketing and operations career with a number of large restaurant brands. While successful in my career, I missed the younger me. I missed the person who spent hours in the brook and days chilling with the dog. My career required significant travel and during many of those trips, I would extend my trip over the weekend so that I could visit the local zoo. I looked forward to the day when things would settle and a dog could become part of my life. By the early 2000’s, this dream became a reality. In 2002, I chose to adopt a retired racing greyhound. I had always been fascinated with the breed and felt an older dog would be a better fit for my life than a puppy. What I didn’t realize was that this decision was going to introduce me to something much bigger. The Greyhound Cult. This cult is full of passionate and caring people who live to love their dogs, no expense spared. While they recognize that a greyhound IS a dog, it does have some special needs and requirements. First and foremost, it is proportionally sized differently than any other breed. Long and lean with a head smaller than its’ neck, regular buckle collars and harnesses are not an option. Long legs, big chests, short fur and little body fat, coats are a must in cold weather but don’t try to find one that fits at your local pet store. Lastly, don’t EVER think about asking a greyhound to lie down on a hard surface without a few beds stacked to cushion his bony body. So began my journey to start The Green Hound. What I learned from greyhound owners is that they are incredibly savvy shoppers. I also learned that there is an incredible group of talented greyhound savvy vendors who cherish the breed and its’ beauty. You put the two together in one place and you have a craziness that cannot be easily explained to even your closest friends and family. 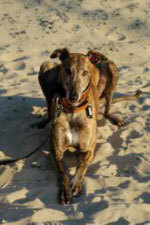 In 2003 I attended my first big greyhound event in Dewey Beach Delaware called Greyhounds Reach the Beach. The estimate attendance that year was around 2,000 greyhounds. The hotels, beaches, and sidewalks were transformed into a four-day greyhound fashion show with each attendee trying to upstage the next with the latest collar, coat and t-shirt style. There were giant tents filled with talented vendors (100+) selling not just greyhound coats and collars but human clothes, jewelry, housewares and all things greyhound. There was even a greyhound art show featuring amazing artists capturing the beauty of the breed in painting, pottery, sculptures and fabric. I arrived with my boy in the same blue, $4 martingale collar that he had been wearing when I adopted him. Of course, I took the time to buy a matching harness and leash. In my mind, we were styling. Then our first walk on the beach with all the other hounds made me want to run back to the hotel and hide in embarrassment. Greyhounds we met were not wearing just one collar but two! Along with their martingale collar, a kind greyhound owner explained the second collar is called a “tag collar”. This collar is generally smaller, without a D-ring and worn all the time with all ID tags attached. The second collar, the martingale collar, they only wear for walking. Because a greyhound’s head is smaller than its neck, a martingale collar is designed to get smaller when pulled making it harder for the dog to slip the collar. Harder but not necessarily impossible. If the dog slips the collar and the ID tags are on the collar, the dog is now running naked with no way of identifying him. In addition, martingale collars can be dangerous if the D-ring gets caught on something. A dog will react by trying to pull away and they can and have choked to death. Therefore, martingale collars should only be worn when the dog is being supervised. So much new and useful information. So my shopping journey began and by the end of our trip, I was the proud owner of a new $35 silk brocade martingale collar with matching $20 velvet tag collar and matching $20 velvet leash lovingly made by some small entrepreneur in her home. Yep, if you did the math you know I spent $75 to outfit him that weekend. However, I don’t think I’ve ever felt so satisfied with a purchase as I did during this shopping extravaganza! My boy was now truly styling. His new wardrobe helped me to keep him safe. My purchase was unique and not likely to be found being worn by others. Best of all, I supported an entrepreneur whose gift of design, creativity, and caring just added to the specialness of my purchase. Over the years, my boy’s wardrobe grew. A leash hook turned into a collar cabinet. Extra coat hooks hung by the door to hold all his coats (single fleece, reflective fleece, double fleece, hoodie, raincoat, winter coat, etc). Eventually, a bureau was purchased to hold his offseason wearables. Not one of these purchases came from a big box store. I met many of the vendors and came to know them personally over the years. I loved hearing their stories of how their businesses came to be, changed and continued to challenge them. Their brands are not well known but their connection with their customers would be the envy of big brands like Nike and Disney. As the years have passed and I continue to volunteer and network in the greyhound community, I have found that I am often being consulted on the pet products I use and my dogs wear. Beyond the wardrobe needs of my dogs and myself, I often find myself looking for the perfect dog walking bag, poop bags, water bottle, etc. In addition, I am a safety nut and have spent way too many hours assisting dog owners with finding a lost pet. Losing one of my dogs is truly my worst nightmare so in recent years, GPS trackers have been added to the wardrobe of all my dogs. I have become a pet product junkie of sorts so I have decided that I should share my findings with other pet parents. Outside of my volunteer work, I also work part time as a brand ambassador/pet nutritionist for a new, five-star rated (by Dog Food Advisor), pet food company. I spend most of this time working in one of the big box retail stores learning about the needs of all pets. What I have learned is that there is a better approach to providing products and care for our pets than what the big box retailers are offering. 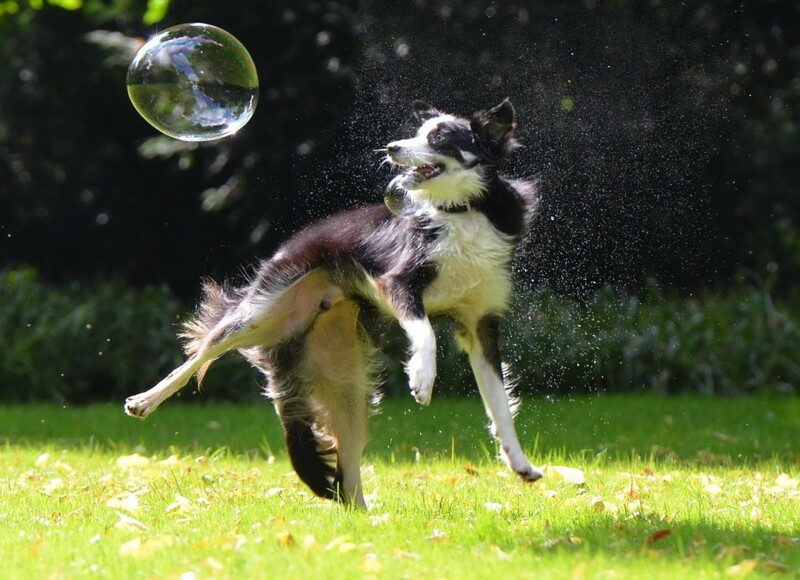 There is a vast number of small entrepreneurs creating unique, quality products, many of which solve our day to day challenges and make it easier for us to care for our pets. We owe ourselves and our pets access to these products. So, welcome to The Green Hound. A place where I hope you will discover something new that will enhance your life, your pet’s life or the life of a budding entrepreneur. I look forward to sharing new products with you and hope you can let me in on your favorite products and vendors as well.